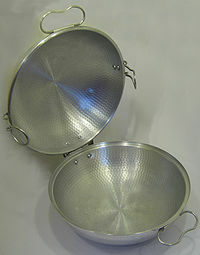 A cataplana is an item of cookware used to prepare Portuguese seafood dishes, popular in the country's Algarve region. According to The Oxford Companion to Food, the most famous dish made in a cataplana is amêijoas na cataplana (clams in cataplana). The cataplana is traditionally made of copper and shaped like two clamshells hinged at one end and able to be sealed using a clamp on either side of the assembly. Cataplanas can also be made of aluminium. ^ Portuguese Cooking: An Unforgettable Journey Through the Flavors and Colours of a Fascinating Country. Florence: Bonechi Books. 2006. p. 11. ISBN 88-476-0921-6. ^ a b Davidson, Alan (2014). Jaine, Tom (ed.). The Oxford Companion to Food (3rd ed.). Oxford: Oxford University Press. p. 150. ISBN 978-0199677337. This page was last edited on 22 July 2018, at 23:34 (UTC).